Typically we try to choose a food photo as the featured image for every review. You people (you wonderfully hungry Duval residents) pretty much showed us that if it’s a picture of the food you’re more likely to click on it. For this post, I can’t do that. The Sushi always has amazing presentation so it’s certainly not that the food looks unappetizing. It’s just that the inside is so stunning. Sashimi Fusion is located just North of McCormick on Monument Road. If you aren’t familiar with it this area is very residential. Not a bad thing, but certainly not the location you’d expect the decor you encounter in Sashimi Fusion. Three doors down from Sashimi Fusion is a ho-hum Italian restaurant. Immediately next door is a dry cleaner. There’s a dentist, a Publix, a cell phone store, and a Starbucks in the same plaza. What I’m trying to explain is this is not an area where aesthetics are paramount. 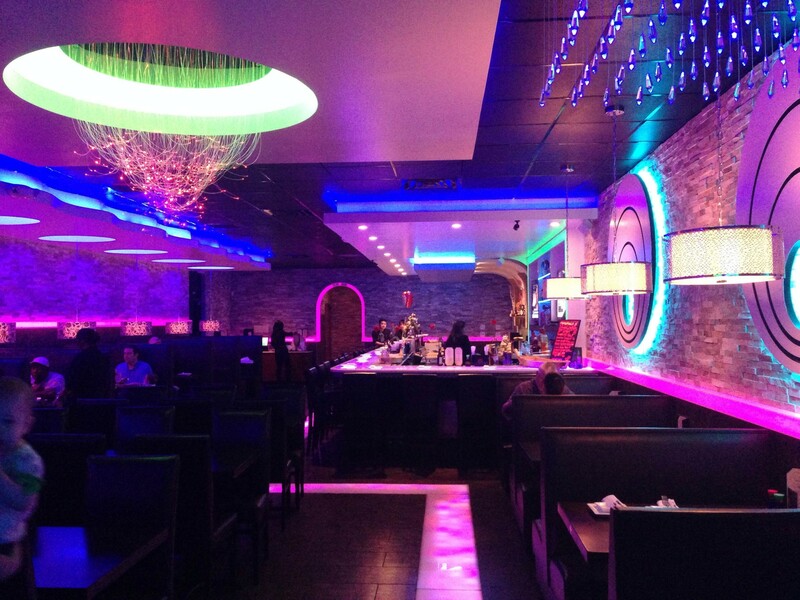 Sashimi Fusion is very dark inside with indirect neon lighting, an amazing modern fiber optic chandelier. In floor glow panels, under bar lighting and no external light give it a very hip feel. None of it is kitsch, it’s well executed. The aesthetics at Sashimi Fusion would fit in with some of the nicer restaurants at the Town Center, or downtown Chicago, or at 5 star hotel. Given the design, it’s location is just odd. I know, I know, you came here to read a food review. Food: The food at Sashimi Fusion is good. The problem is that you’re expectations are pretty unreasonable after being exposed to the design. The menu is pretty standard for a Japanese restaurant. They offer plenty of unique sushi rolls and have a Hibachi, Terriyaki, and Tempura section as well. For this trip we had 3 adults, a three year old and a one year old. I’ll talk more about how that played out under service, but clearly I wasn’t thinking of food accessibility for the younger crowd. There is no kids menu, but I’d still say the place is kid-friendly. We started with Tempura Veggies ($5). This particular night we had an onion, sweet potato, broccoli, mushroom, and zucchini. The tempura doesn’t really stand out. It was good tempura, but unless you really need veggie tempura find another appetizer. For my party fried veggies is a trojan horse for veggie deliver to the three year old. Hibachi Scallop ($17.95) and Hibachi Chicken ($13.95) were two of the main courses at our table. I’m grouping them together because aside from the protein, they’re the same dish. I will say the scallops were prepared nicely. Enough browning on the outside but still light and tender. Both of these meals come with Miso Soup, Salad, and Fried Rice and Noodles. I’m not overly excited about Miso Soup most of the time, and it’s no different at Sashimi Fusion. The Miso is good enough. The Salads are actually of note. We were offered the choice of two dressings, ranch or ginger. Both Salads were on the edge of brown. Questionable lettuce you might eat at your house before it goes bad but certainly not something you’d serve at a restaurant. The noodles are heavy on the black pepper. Not too much, but if you don’t like black pepper get a double serving of fried rice. Also on the plate were some teriyaki veggies. For the three year we ordered Chicken Katsu ($10). Chicken Katsu is pretty much breaded chicken breast, essentially a big chicken nugget! It comes with a side of Katsu sauce. I’d equate that to Japanese BBQ sauce. I was really interested in a sushi roll but having a hard time deciding. I asked the waitress for a recommendation of something that was a bit spicy but not too crazy. She suggested the Mexican Bubble Roll ($11) which is shrimp tempura, cream cheese, fresh jalapeños, topped with spicy shrimp, tempura crunch and eel sauce, and jalapeño sauce. 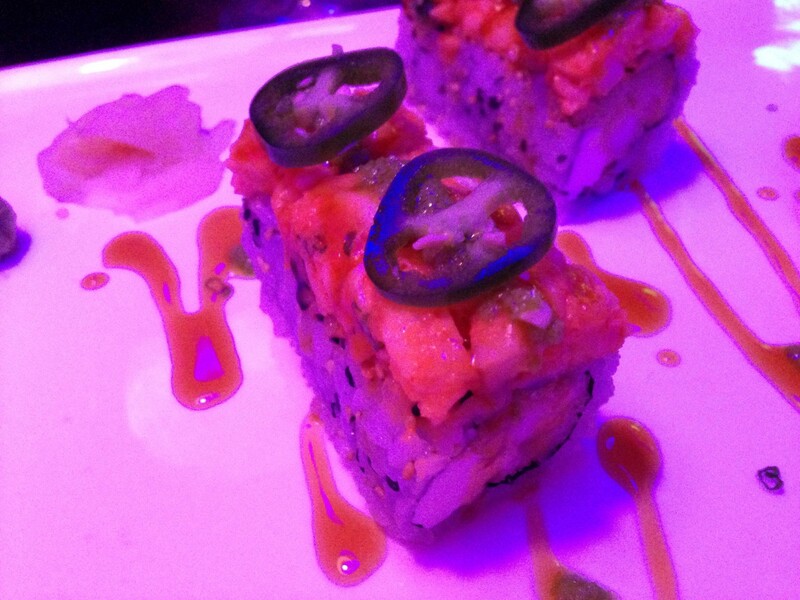 The jalapeños offer a different kind of spice from what’s ordinarily expected at a sushi place. It was the right amount of spice and I was really happy with the suggestion. On previous occasions I’ve ordered off of the sushi entrees menu. The presentation is always interesting. On one occasion an ice-cube was on the plate with some kind of LED glowing inside to match the indirect red and blue light at our table. Very slick! The menu does have some mis-spellings that bothered me. They also carry over to the bill when it’s time to pay. I don’t blame that on a lack of attention to detail, just not enough time spent editing. However, it doesn’t fit in the scheme of the decor. Service: Eating out with two kids is tough. Especially when you go into a restaurant that is little more than just-the-basics. We always try to eat early if the kids are with us and did so at Sashimi Fusion. Our waitress was awesome. She knew how to talk to our older kid. He had his own chopsticks and she brought out some plastic cheaters so he could eat like the grown ups. At one point he needed a real spoon, but they only have huge Asian soup spoons, so she brought him a plastic to-go spoon. Our one year old is a loud eater. She’ll eat anything, but she wants to give you her opinion on it, which equates to loud babbling. We were seated near the front of the restaurant away from other diners. I appreciated that the hostess was realistic when we walked in with two young kids. We aren’t the only ones that take our children to challenging restaurants. As we were eating another couple with kids about the same age as ours came in. From what I could see the waitstaff was just as attentive to them as well. Sashimi Fusion is a great place to take a date (after the families are done). Your date should be impressed by two things. First, that you know a good Japanese restaurant in such a strange part of town. Second, that the decor is so amazing. What you’re hoping is they miss the fact that the sushi and hibachi aren’t as amazing as the rest of the place. Tagged Japanese, outdoor seating, seafood, Sushi Restaurants. Bookmark the permalink. I think the hibachi is above average and their fried rice is the best I have eaten. I too have a kid and they let me order a lunch portion for her. They were very accommodating. I wish they had some different cold sake selections. Either way, we love the place. Oh and the decor was awesome! We loved it! I lived in Japan for 13 years and have been married to my Japanese wife for 20 years. If she says the food is “GREAT”, then I would say they’ve more than hit the mark. Terry and Cindy(owners) are wonderful people and the food, service, and price can’t be beat, PERIOD!